On the surface, the implications of this spoon even escaped my critical eye when I purchased this piece, yet there is a deeper meaning to this spoon. Enjoy the story, and see if you can figure it out before I hit the bottom line. The particular spoon in question is a very nice extra large Watson (Mechanics Div.) spoon with a picture of Bacchante, holding a child and a bunch of grapes. As you probably know, Bacchante is the female version of Bacchus, the God of Wine. 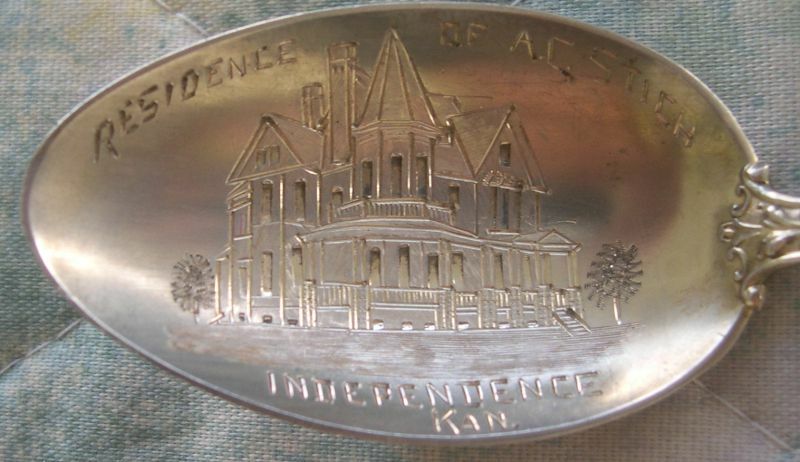 Bright cut engraved in the bowl of this spoon is a picture of a stately looking Victorian era mansion which is labeled as the "Residence of A.C. Stich" of Independence, Kansas. On the surface this is a very nice, but unremarkable souvenir spoon. Research traced the home to Adolph Carl Stich who was a forty year resident of Independence, Kansas. Mr. Stich was known as a founder of Stich Brothers, a general merchandise store, which grew and prospered along with the growth of the community. In 1883 he purchased Hull's Banking House and became the major banker in the town. As one of the richest and most influential citizens, he was instrumental in building the local hotel, Beldorf Theater, Carnegie Library, Washburn College, Kansas Gas and Electric Company and a major stockholder in Prairie Oil and Gas (from which most of his fortune was derived). Because he was such a prominent citizen, he was overwhelmingly elected as a Republican mayor in 1907. Now the story gets interesting. Kansas was one of the first states that regulated liquor sales, and liquor was not allowed to be consumed in the place where it was purchased. The liquor drinking men would buy bottles of booze and then they would go into the alleys where they would consume the spirits. Of course they were not particularly careful about what they did with the empty bottles, and the local boys would gather the bottles for reuse, but there was often a few drops of alcohol in the empties, and the boys would drain the bottles. Mr. Stich was a very deeply religious person and his Presbyterian church was deeply involved in the temperance movement which was very active at that time. Without regard for constitutional or civil rights, as Mayor, he demanded that the police arrest any man found drinking in public (which was technically legal) because such men were "contributing to the delinquency of the minors" (Very similar to the political calls we hear today "anything for the children"). Although many people approved of his draconian methods, needless to say, some people were not appreciative of the abuse of the government powers and the dictatorial style of arrest and punishment advocated by Mr. Stich. Hopefully you have figured out this spoon by now. 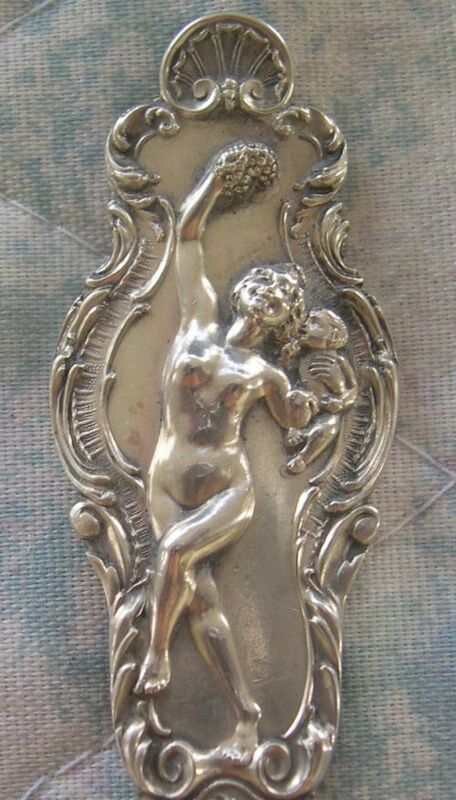 The designer was obviously making a subtle political "dig" at Mr. Stich by deliberately using Bacchante, the Goddess of Wine, along with Mr. Stich's house in this spoon.